A good goof off day. Nothing beats it. You know how it is… You know from the moment you force your eyelids apart, today is not going to be a good day for work. If you’re an employee, it’s the day we used to call a mental health day. You’re not sick. You’re just… over it. That was me this morning. It’s been a pretty busy few days here and while I’m no stranger to busy, these were also very social days. Being an introvert, I find being ‘on’ all the time, very draining. Therefore, I’ve designated today ‘Goof Off Day‘. I will goof off and I will not feel guilty about. Not one little bit! What’s on the Goof Off Day agenda? Baking! What is it about baking that helps you relax? Is it knowing you’ll have a nice treat at the end of your labours or is it that it reminds us of our childhood and making mud pies? I pondered that question for a moment or two then decided to see what Mr Google had to say on the subject. Here’s what I found. And, its results make other people happy. There were 741,000 other results so, obviously baking as therapy is nothing new! What’s come out of the oven so far? Sift (or whisk) together the flour and baking powder, then add salt. Rub butter into flour using fingertips. Mix into a soft dough using most of the milk. I like the dough to be a bit sticky rather than dry so be guided by the texture of the dough not the measurement of the milk. Turn onto a floured board and knead until smooth. Roll out dough to about 2cm thick and cut using either a round scone cutter or a knife. Place on a greased tray and glaze with extra milk. Bake for 10 – 12 minutes. The tops will be golden brown and the sides will have set when they’re done. I chose to make scones today because I had some cream left over from making a batch of Potato and Leek soup and my absolute favourite way to enjoy scones is with jam and whipped cream. Whatever isn’t eaten today, will be frozen for the next time there’s spare cream needing to be used productively. I use a very simple Quick Mix Chocolate Cake recipe like this but divide it into patty pans to make cupcakes rather than one cake. Once they’ve cooled (and I’ve tested one or two) I’ll wrap them up and pop them in the freezer so we have a treat available when we need one. I usually do my bread baking on the weekend and given today was weekend kind of day, as in no discernible (that is, profitable) work, baking some bread rolls seemed appropriate. 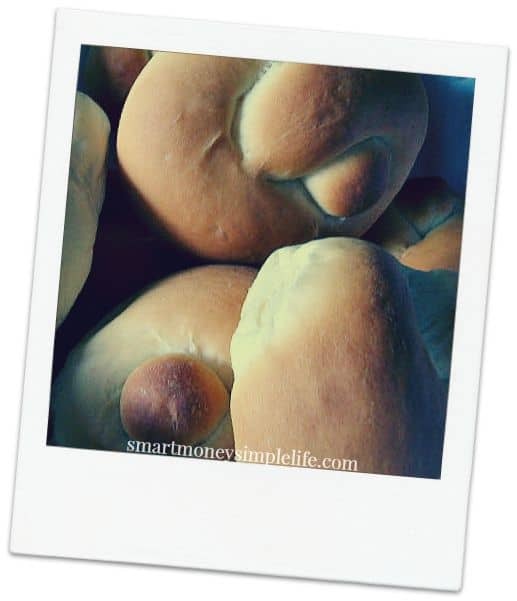 Baking your own bread is not just frugal, it means you know exactly what’s in your food. No nasty additives! Next on the Goof Off Day agenda? Catching some sunshine. The sun is shining at the moment and the best way I know to take advantage of a sunny day is a comfy seat on the veranda and a good book. I’m currently in the middle of The Thin Green Line: The Money Secrets of the Super Wealthy by Paul Sullivan and it definitely deserves some uninterrupted reading time. The Hidden Benefit of My Goof Off Day? Between the baking and reading I’m feeling rested and refreshed. 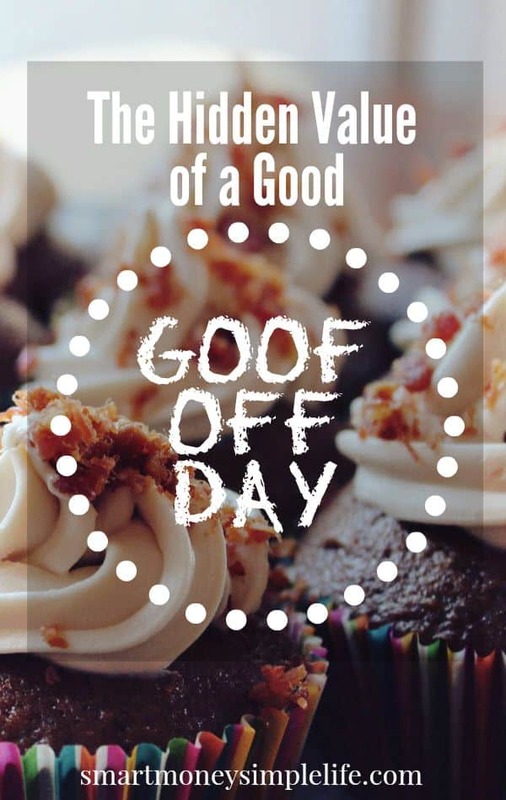 Tomorrow is a new day and one that’s bound to be far more productive for having taken note of how I was feeling this morning and rather than force myself to push through the day, I’ve taken time out to do what felt necessary – goof off. The odd thing is, by spending time in the kitchen I’ve prepared goodies and bread for the next few days and I’ve got some required reading done. And, none of it felt like work. Plus, having a treat or two in the freezer for those times you just need something sweet is not just a great time saver, it’s a great money saver, too. I might not have got through any of my formal work tasks today but I haven’t missed any deadlines. Nothing on my day’s to do list was urgent and I’m sure I’ll be ready to dive into them with gusto… tomorrow! Do you give yourself permission to have a Goof Off Day when you need one? What do you choose to do to recharge? On my goof off days I like to garden, hike, watch a movie at home or take photos. I’m definitely a homebody and like taking time off to do fun stuff at home. The modern world isn’t really designed for introverts which is just another reason I love working from home. I remember those days! Being a single parent for the last 13 years, goof off days were rarer than hen’s teeth. That’s why I appreciate them so much now.